Go Texas western style with these exotic cowhide luggage bags and business accessories. Choose genuine brindle hair on hide luggage cases or tanned leather cowhide specially imprinted with faux ostrich print (the ostrich skin look and functionality without the ostrich price). Hand made in Texas custom leather satchels, boot bags and legal pads, all part our Texas arts and crafts and Texas corporate gifts collections. Please be aware that hair on hide has variations in hide patterns (that uniqueness is part of its beauty). So, if you are purchasing multiple hair on hide products on a single order, we make no representations that the hair on hides will be identical. These custom made products are not returnable or exchangeable. Unless we have these in stock it is not a quick ship item (depending on the season it may take a month or more to make, especially if you need a bunch of them), so for trip planning or special meeting projects please place orders as early as possible. These ostrich print and hair on hide cowhide exotics can have a leather nameplate attached for personalization (with up to five letters or initials – all CAPS no periods) or for your corporate logo – contact us for logo questions. 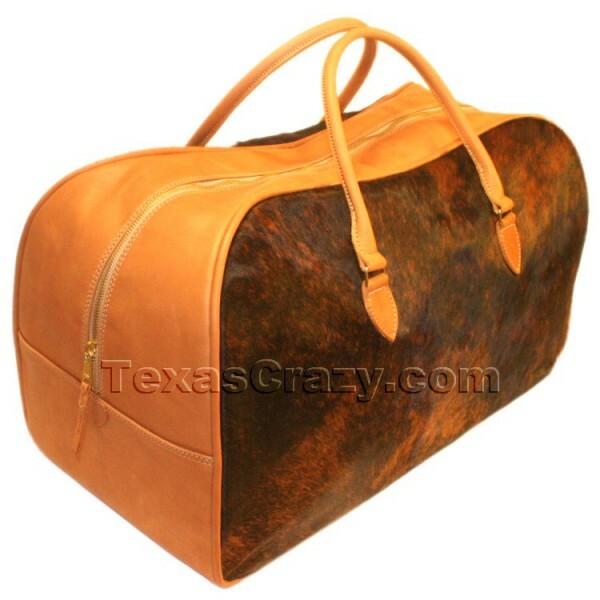 For more details or to purchase one of these exotic cowhide luggage from our Texas luggage collection, click on any image below.